We bought this house a year ago and I have slowly been working on the (neglected) yard. 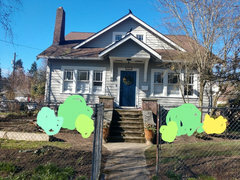 I have been graphing and taking time to plan things out but I am still unsure on what to do for the front of the house foundational plantings. 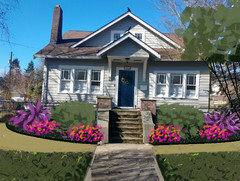 I was thinking 3 shrubs on each side, with the middle one being an evergreen. Original thought was Let's dance Diva hydrangea flanking the steps (because I already have them), a Mexican orange blossom (or PJM rhodedendrum) as the evergreen in the middle and then perhaps a little lime hydrangea on the outside. But I am not totally wowed by this idea and I was hoping for others insight and opinions. Other notes, the house faces East but left side of the entry gets quite a bit of southern exposure while the right side is significantly more shaded. The right side currently has a serviceberry tree that we are unsure if we should keep or remove. I prefer more of an English garden vs traditional PNW style. I want to keep colors softer (whites, blues, purples) vs bold (red, orange). Fence will be replaced and raised bed will be removed. I'd put the evergreen shrubs at the corners and the deciduous ones between. So that there is evergreen structure enclosing the grouping. And use identical pairs or other matching combinations of numbers of every kind used so that each half of the planting is exactly the same as the other half. Do this because your house has a geometrically symmetric facade - if the planting is not as uniform as the facade then the house and planting will not look to be coordinated with one another. 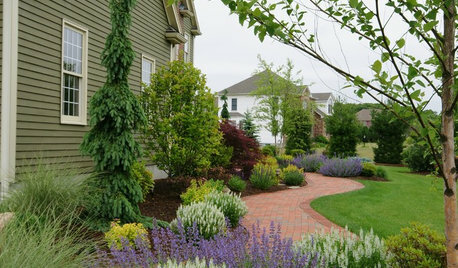 Your twin planters at the start of the steps are an example of what I am talking about. 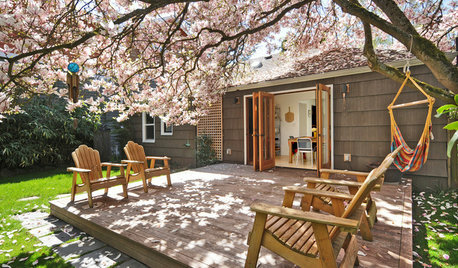 To have it all "go" with the design of the house continue this same approach through the rest of the project. I'm not saying to plant the whole yard like this, probably just the part that is right in front of that prominent facade. These are suggestions about sizes, shapes, organization, etc. Not picking plants or colors for you. 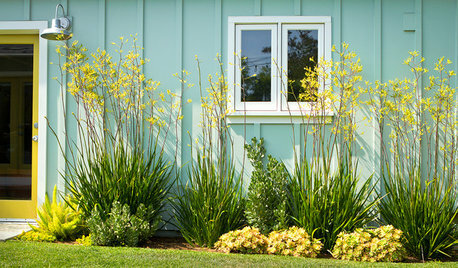 I'm using only a single shrub below each bank of windows and perennials bordering the house corners. (It could be shrubs.) Then there are annuals. 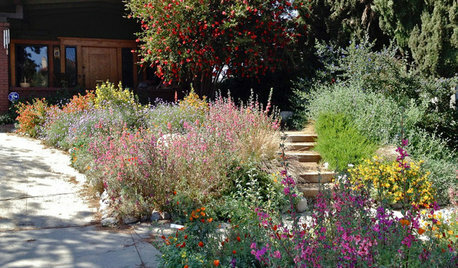 It could be perennials) and some annuals for color. And a little groundcover to round out the bed. I'd get rid of the serviceberry in favor of small tree form located farther away from house. yes, I agree that both sides need to match. so you would recommend two evergreens with a deciduous in the middle. or I could do one large evergreen with smaller perrenials as Yaardvark shows. I feel that whatever I have in the middle should give the most height, is this correct? And that is why I was originally leaning towards an evergreen in that spot. Do Mexican orange blossom and hydrangea make an okay foundational pairing? since it's the front of the house and it will take the plants a while to fill out, I rather get it right the first time. And it is a subjective decision but I would not remove the serviceberry. I do not find its placement at all objectionable and it will be a long time before another tree will assume that sort of presence if removed and replanted. I also disagree that the plantings must be mirror imaged or identical - symmetry can be developed with balance as well.....just take a bit more skill and finesse than going the matchy-matchy route! Thanks gardengal, I always appreciate your insight since we are in the same city. I have been going on lots of walks and visiting nurseries this winter to just survey lots of evergreens for ideas but I haven't been in love with anything. we did have two Mexican oranges at our last house and I agree the one in sun did better but they did pretty well overall. Do you have any recommendations for an evergreen? I was thinking something that would grow to 5-6ft? And one of the reasons I was considering the Mexican orange or a PJM rhodedendrum. 6ft would hit right at the bottom of the windowsill. If you don't mind some occasional pruning, there are too many shrubs to list! But not all that many will grow to 6' and stop...the choisya has the potential to get considerably larger. And I wouldn't necssarily limit the rhododendron selection to just PJM.....many other cultivars would work equally as well. I'd gve it another few weeks and then check out local nurseries. 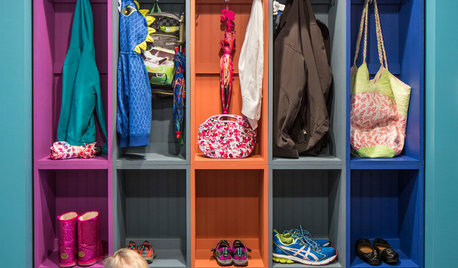 Most are only just beginning to bring in new stock for spring and BLE's tend to be the last in. And what has been overwintered onsite are just last season's leftovers and not a full selection of choices. As I stated previously, the plants do not need to match on both sides......they just need to have approximately the same mass and presence once established to provide a degree of symmetry. Thanks, I will look into those varieties later today. What does BLE stand for? 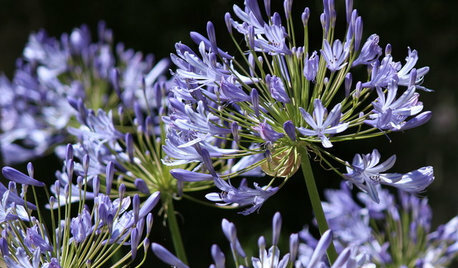 If you are not familiar with it, check out the Great Plant Picks website. 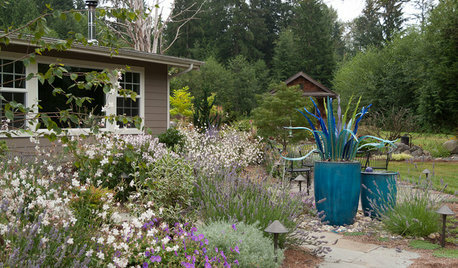 This is a compilation of plants that do very well in PNW gardens and are easy to locate at area nurseries. 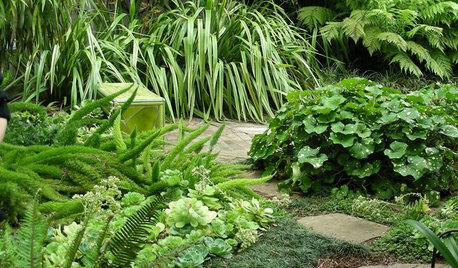 It was developed by local nurserypeople, horticulturists and landscapers who really know their stuff and offers a wide array of plants listed by type, usage or preferred growing conditions. And all with photos. An extremely valuable resource for PNW gardeners! You always want to have balance. There is asymmetric balance and there is symmetric balance. The geometric symmetry of the house facade means that asymmetric plantings placed directly in front it will produce a visual discordance. This fact of frequently shared perception is why you put the twin planted pots where the steps begin - the design of the house pointed you in that direction. I am thinking Im going to go somewhat symmetrical for ease of a newbie like myself. The only two I might not have match are the outer corners because they have drastically different sun light (left corner-full sun, right corner-partial/full shade). Unless I can find a variety that can take full sun and full shade. I did a little a quick mockup with colors to represent varieties. I looked up the varieties you mentioned gardengal as well as started looking at the site you mentioned. 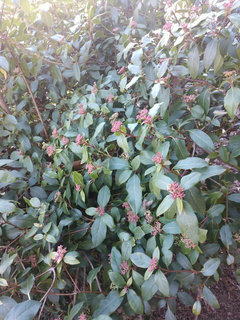 My favorites are the Pieris white Cascade but I worry that it is posionous (small kids) and the Osmanthus Burkwoodii. I do also love the gracefulness of the Loncicera Lemon Beauty and my neighbor has one I often admire BUT I worry it tends to lean more Japanese-PNW garden where I would really love more of an English garden with PNW suitable plants. I do like the Mahonias but I think it would work better in my back garden where I plan to have Hostas and ferns and think it would mix in quite nicely there. A came across Viburnum Tinus which I like as well. And as mentioned I think the Osmanthus Burkwoodii would be quite beautiful and I like it is fragranced. would these be better than a Mexican orange blossom or rhodi? Would they mix well with hydrangeas? sorry for my incredibly long post. And sorry if I come across as incredibly picky. 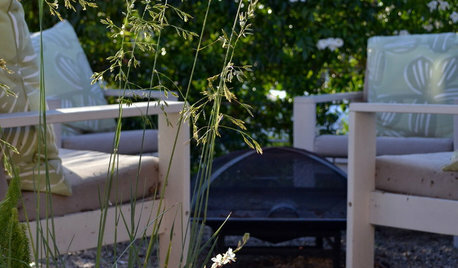 Our last garden had been professionally landscaped before we purchased it and it was very much a PNW garden (Acers, heavenly bamboo, grasses, etc) and was very pretty. And while this yard is a mess, I figure it's also a blank slate so I can hopefully make it what I have always hoped for. "Better" is subjective....it is what you like that matters. And I would not get overly concerned about poisonous plants. More plants are poisonous than those that are not and there is nothing about the pieris that would encourage anyone to munch on it. FWIW rhodies are quite toxic as well. very true gardengal. I did stop in my neighborhood nursery since it's a block away and looked at some of the plants you recommended. I did like the mountain pepper in person more (stems seemed more purple then red). I didn't like the Pieris as much in person. I didn't see any of the others but I do think maybe I saw the Osmanthus on a walk. picture below. And I did like the foliage on the PJM compacta and regal. I do like Daphne's quite a bit too but I worry about them suddenly dying. Ultimately I want something that will be a good companion plant for hydrangeas. so I am thinking a darker green, chartreuse or purple foliage might be best to contrast with the medium green foliage of hydrangeas? Look at leaf shape and texture for contrast as well as color. With the big leaves of the hydrangeas, I'd consider the mahonia or the pepper plant. The purplish coloring on the rhodies' leaves is only apparent in cold weather - they are green the rest of the year. 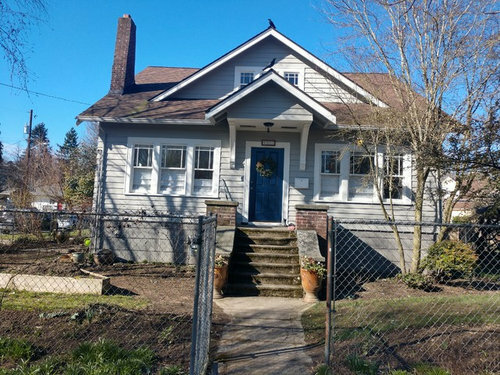 Curb appeal needed in PNW!